Elvis’s racquetball court, now a showcase for some of his awards and costumes. Yesterday was all about Elvis. We toured Graceland. We were expecting it to be hyper-touristy and one of those things that you just have to do, even if you know you’re being fleeced. It was hyper-touristy, but we were pleasantly surprised. Instead of feeling exploited, we were enthralled. Every visitor was given an iPad with an interactive app that brought the personality of Elvis to life. It was so sensitively done that I cried when the iPad told me Elvis died. And Gabriella has become Elvis’s latest fan. Elvis seemed never to forget his humble beginnings and was always immensely grateful to his fans. Despite his conspicuous consumption (8 cars, 2 planes, and a wild “jungle room”), he always gave money generously to whoever needed it. He worked hard too – often performing four times in one day. His philandering and addiction to prescription drugs weren’t mentioned, but Graceland is owned by his daughter, Lisa Marie, so that’s not surprising. 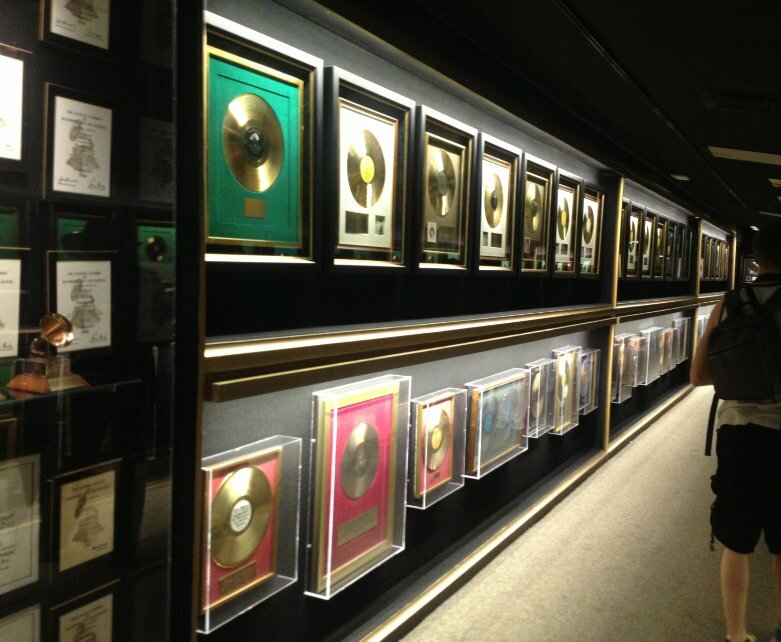 The “Hall of Gold” at Graceland. 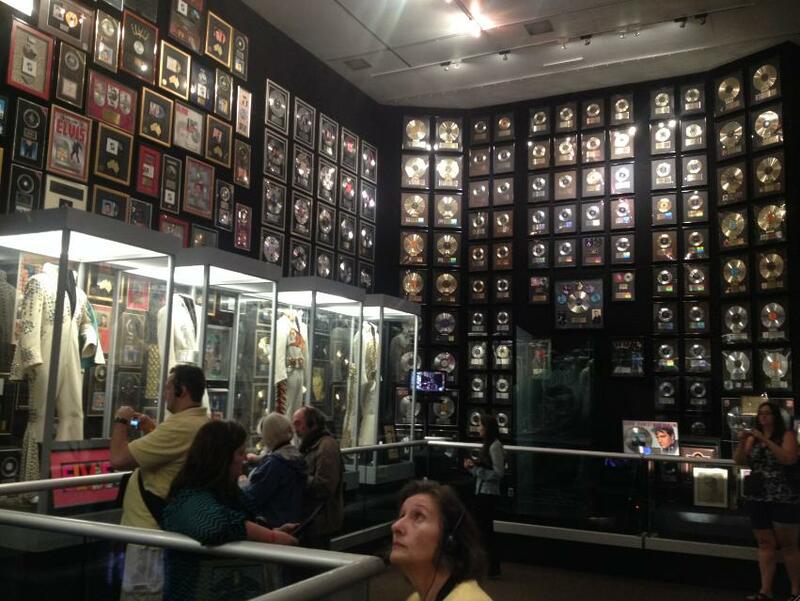 A tiny portion of the gold and platinum records that Elvis was awarded. After Graceland, we visited Sun Studio in Memphis. Sun Studio was the first studio to sign up Elvis. It came about because Sam Phillips, Sun’s owner, needed a lead singer to go with a guitarist and double bass player he’d found. The three guys jammed together and created a fabulous sound, which Sam recorded straightaway and passed on to his in-house DJ to play on the radio. Elvis’s contract was for three years, but Sam sold it to RCA after just 18 months for $35,000. With the hindsight of knowing that Elvis was worth millions of dollars to RCA, Sam’s sale sounds like a terrible deal. But Sam was just starting out in the business, and he realised he couldn’t afford to market Elvis properly. Instead, he sacrificed Elvis to be able to set his studio up to look after his other artists properly. One of his next stars was Johnny Cash, a consistent hit-maker, so taking the money for Elvis turned out to be a good investment. 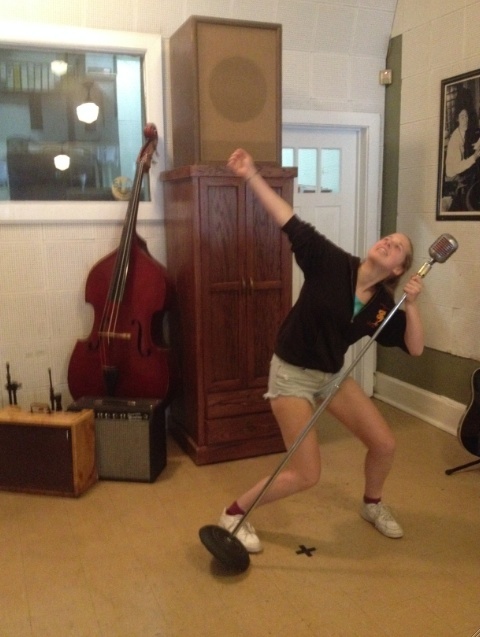 Rocking out in Sun Studio. X marks the spot where Elvis stood to record.